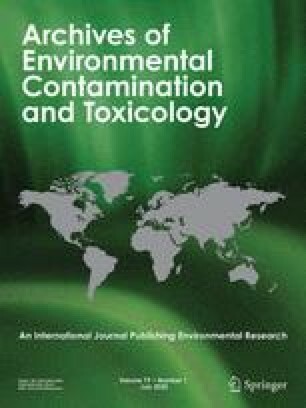 Long-term exposure of aquatic organisms to metals, even those considered micronutrients, may affect their metabolism and produce sublethal effects. We evaluated the effects of long-term exposure of adult amphibian (Bufo arenarum) females to 4 μg/L of Zn2+ (ZnSO4· H2O) in Ringer solution on the concentration of Zn and Fe, the activity of the key enzyme of the pentose phosphate pathway glucose 6-phosphate dehydrogenase, and glutathione content, both in the liver and ovary of these animals. We also performed early embryonic development studies by in vitro insemination from control and treated females. Zn exposure rendered lower Zn concentrations in the ovaries than did exposure of animals to Ringer solution without metal addition (97 ± 50 versus 149 ± 46 Zn μg/wet tissue g). Zn and Fe concentration correlation was positive and linear in the ovary, but was negative and nonlinear in the liver of the studied females. The activity of the enzyme glucose 6-phosphate dehydrogenase decreased (0.0599 ± 0.0109 versus 0.0776 ± 0.0263 μmol of NADPH/min · mg of proteins) and the endogenous glutathione content increased (0.027 ± 0.005 versus 0.018 ± 0.007 mg/10 mg of proteins) in the ovary but remained unaltered in the liver as a consequence of Zn treatment. Our results suggest the existence of different mechanisms of regulation of Zn and Fe concentrations in the ovary and in the liver of adult B. arenarum females. Binding of Zn to low-molecular-weight proteins, as metallothioneins, may occur in the liver, thus protecting this organ from toxic effects. In the ovary high-molecular-weight proteins, like glucose-6-phosphate dehydrogenase, should be able to bind Zn, leading to oxidative stress responsible for the observed increase in endogenous glutathione content. Inhibition of the pentose phosphate pathway in the ovary by Zn can be responsible for the reproductive failure that we detected through embryos survival studies during early life stages: 81.3 ± 6.3% of embryos from control females survived versus 63.1 ± 13.8% of embryos from Zn-treated females at the branchial circulation stage of development.